Using a small sharp knife, pierce the squash all over to prevent bursting. Cook squash in a microwave (high power) for about 8-10 minutes. Turn over the squash, and microwave again for another 8-10 minutes until the skin is slightly soft when pressed. Leave squash in the microwave to cool down slightly, about 5-10 minutes. Remove squash from the microwave, place it on a large cutting board and cut it lengthwise. Remove the seeds and discard. Scrape the meat with the fork, separating the strands as you go, and place them in a large bowl. Set aside. Heat the olive oil in a large skillet over medium high heat. Add garlic and cook until fragrant. Toss the sausage into the skillet, cook and stir until browned. Add frozen peas, continue cooking until the peas are cooked through. 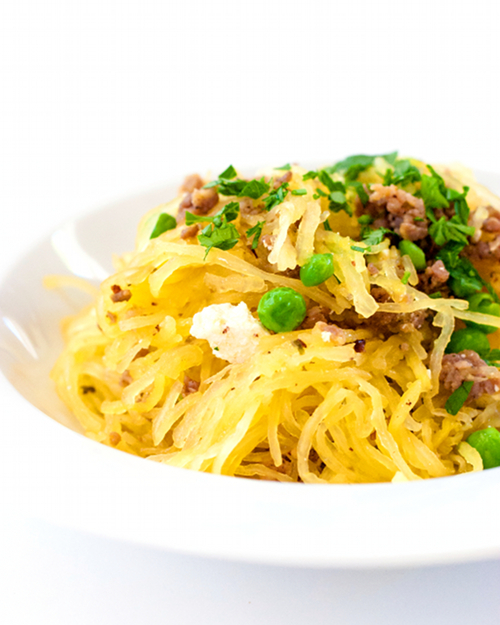 Add spaghetti squash into the skillet, then add feta cheese and chopped oregano. Season with salt and pepper. Mix all the ingredients together. Transfer to plates, sprinkle with chopped parsley, and serve hot. Note: If you choose not to use the microwave, squash can be baked in 350 degree oven for 1 to 1- 1/2 hours.